Yes, I am so excited about trying something new that I nearly forgot to add the formerly used photo. Maybe I'll try it again and get good at it. Currently, it's something of a red hot mess. I think that you can best tell what I did in the "Thinking of You" card where you can see the horizon line. I didn't like that look and so my experiments took me to blotting that line, which is how I wound up with shadows and blotches and a generally muddled look. Ahhhh...the joy of trying something new. Looking forward to seeing your note cards this evening! P.S. 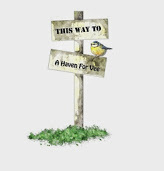 If you visit the directions page *here,* you will find new buttons added at the bottom. Perhaps there is finally something for everyone. Oh, I really like your experimenting. Love these note cards. Looking forward to see what everyone comes up with. I like them! How fun. Oh dear. I really can read directions. But I misread these and have been cheating ever since the rule was changed. I did not register the part about at least one previously published photo. Alas, I did not follow them this time. You'll see. However, I promise to follow the rules next time. If you don't kick me out onto the sidewalk. Love the teacups and sentiments. My favorite is the first with that sweet nest and egg. There's no horizon line there. You've done a great job. This is always such a fun and interesting linky party. Thanks for hosting, Vee. Tea cup day! I liked your experiments. I know I feel like I learn something each time I "tweak" an image. You know I'd take a set of "tea" cards! Happy Tea Day. Happy Spring. Happy Easter. Thank you for hosting! There were gremlins in my link this morning - sorry about that. I see now that you have fixed it for me!!!! And thought I was getting all 'au fait' with linkies and the like - just shows! Your cups are lovely the first one with the tiny nest is fun but my favorite is the last one, it's kind of homely with the piece of orange on the saucer - a very sweet cup. I like your experimenting! Very nice! I love all of your tea cup note cards Vee. Oh, Vee, I made it this time!! Your teacup photos are beautiful! Now that is a lovely set of cards anyone would be delighted to receive. The first is my favorite. Just dreamy. I would not have thought anything awry had you not said anything, I still can't find what you're talking about. The horizon line, messed with or not looks good…and I love your teacup theme. The teacups are lovely with their embellishments! Very artistic. Thanks for hosting. Vee, these are really beautifully done! I love them and would indeed buy a set. 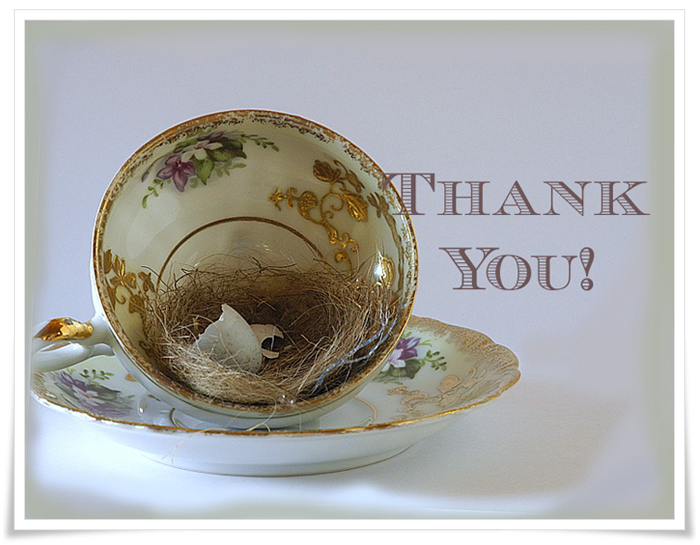 I love that first teacup with the nest and eggs in it. Lovely! Thanks for hosting. I thought that was how you intended it. Uneven lines and wavy lines are all the thing these days. I been experimenting with multi-media ATC cards. Gonna try that next month for greeting cards. Your theme and shots are great. Beautifully done, may I ask you to give a tutorial! or share information! OMG, you are doing studio shots! ***applause*** Love these photos and the concept. I'm so proud of you! If the seam is bothering you, then you can try a seamless background approach. I can send you some links to give you some ideas. Beautifully executed, as usual. Better go see what I can get together for mine! I just published my cards but can't link up with you using this ipad. I love you pretty cards this month. Your setting up and playing around paid off - I think the set of note cards are lovely. 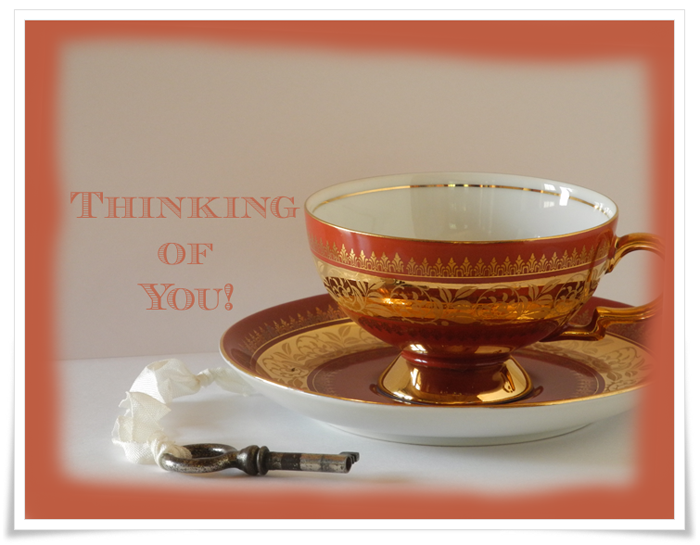 You know I would like to receive anything with teacups and the matching border on 'Thinking of You' makes it that much nicer. I keep saying I'm going to do captions on my cards but always forget. Hey Vee...I did it again! I inadvertantly clicked on last months link again....sorry! I went ahead and added my new one...can you fix it?? Be back later to see everyone and comment....thanks! These look beautiful to me! Also your header is lovely! I love your tea cup note cards Vee. My daughter is here and asked for her tea cup that she picked out many years ago, she wants to take it west with her. Hi Vee! Thanks so much for fixing my little problem. Your linky works a little differently than some others and it holds on to what you link up before it seems. My bad...I didn't look at it close enough. Let me just tell you that your teacup note cards are exquisite! So very unique and the borders you added among the other touches added so much. Thank you, as always for hosting this fun idea exchange! I pray you have a blessed Holy Week! I think your note cards are beautiful and for the life in me can't find any blotches or lines??? Not a mess at all! So pretty! Vee, your teacup notecards are beautiful! I love them, in fact I think they are one of the nicest sets you've done. I don't see any lines or blotches either... I think you're pulling our collective legs.. haha. Lovely! I once had a gorgeous set of teacup notecards... and yours brought to mind memories of several I sent to special friends. What a nice trip down Memory Lane you've given me tonight. 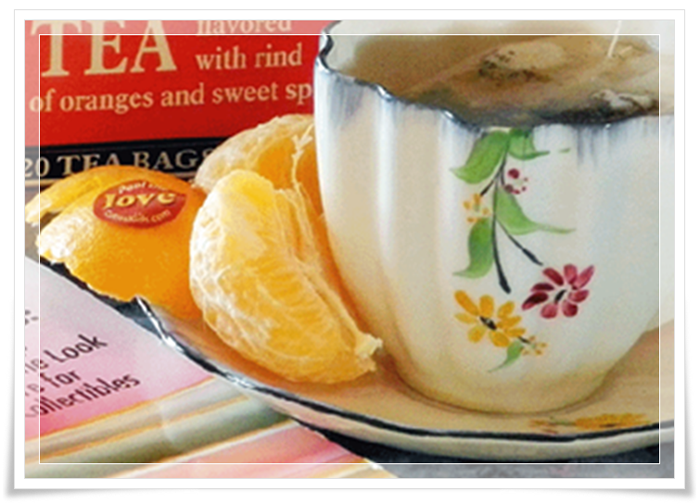 Your little bird's nest in the first cup is an especially sweet touch of Spring! 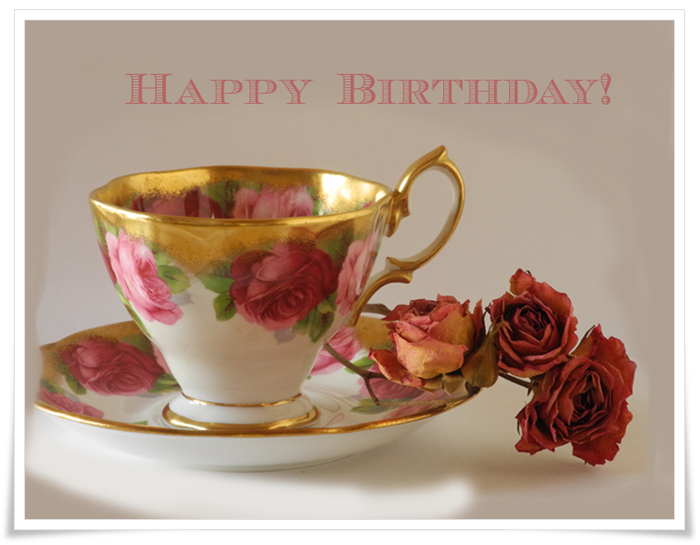 Stunning cups and notecard greetings for tea lovers, Vee! You've gone right to my heart with such lovely images. And, kudos for trying something new - it's how we learn and isn't fooling about with all this technical digital stuff equal parts of joy and frustration? Joy that we have such tools to create with and frustration because they're not always user friendly . . . or am I just too dense to "get it" more often than not. Quite a journey we're all on with our blogging and picmonkey, eh? Thanks for hosting!! Always an inspiring party! Your teacups are very pretty! They make lovely note cards! Now I'm off to do a bit of partying (commenting) before bedtime. I think you have done a great job - you are way too hard on yourself. And I loooooooove your tea cup pics. : - ) Totally makes me smile. Thank you for hosting - always look forward to your card parties. Hugs. So sorry I completely forgot today was note card day! I think all the cards you made a pretty--even the one you don't like, Vee. I thought your cards all looked perfect! I couldn't find any mistakes, Vee. I love your pretty teacup note cards. They remind me of the ones I have that belonged to my mother. Thanks for hosting the party! I'm so glad I could be a part of the fun this month. My RA is so much better. I feel so blessed. These make me want to have tea with you! Such pretty, pretty cards! I hope you are doing well. I have missed visiting you so much my friend. Well, where HAVE you been?! I'll be around to visit soon. I love every one of them. I have a thing about teacups, you know. I was absolutely determined to join this month because this party actually inspires me. It jump starts my creativity and gets the juices flowing. I had my picture choices a while back. It was the text and need to fill my post with superflous words that had me ferhoodled this time. I finally just did what I ought to do: Shut the pie hole and post the pictures. I LOVE what you did and if it's a muddled mess, only you see it. Go Vee! These are so pretty, Vee. I look forward to getting settled and joining in the fun next time. How creative of you and how pretty! Yes, learning new things...it keeps us young! Lovely tea cups - it always amazes me that there are so many china patterns, some so beautiful and many still unclipped or cracked after many, many years of use. Lovely photos Vee - would love to sip a cuppa with you some day - Earl Grey would be fine. Happy week - hope the snow melted! Beautiful teacups. My favorite is that top one! Beautiful note cards too. Hoping everyone will be up to enjoying Easter and feeling much better. Those are pretty teacup notecards! I hope John & the grands are feeling better. Happy Easter! Beautiful notecards Vee! I completely lost track of time and wasn't able to join. I hope you had a joyous and blessed Easter. Dear Vee, love these note cards, something has kept me away but I'm planning on joining in next May?? Hi Vee!! I hope that you and yours are keeping well. Sorry that I haven't been around.. for some reason I've been locked out of my blog for months. I think that the last time I posted was at the beginning of September. 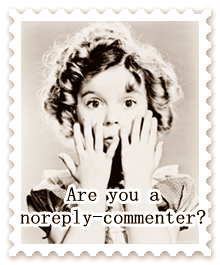 I have had to go back to an old profile just to post comments on others blogs. Anyhow... I hope to stop by from time to time again. I've missed blogging and am thinking about starting again at some point.